Join us for a very special film review on this week’s episode of Watch Culture. I say this because I’m about to drop some knowledge on why The Shape of Water holds a special place in my heart, so much so that I’ll also be running a deep dive on Cross Talk with Chris later in the month (read: sooner). Guillermo del Toro is a Mexican film director, screenwriter, producer and novelist. His films have a strong fantasy element running through them, often using dark themes and gothic backdrops to convey both subtle and overt messages about human nature. Some of his more mainstream films are Pacific Rim, Blade II and the two Hellboy adaptations, but he also dabbles in spanish language focused stories like The Devil’s Backbone and Pan’s Labyrinth. Looking back, his most recent film before The Shape of Water was Crimson Peak, a strong indicator and launching point toward fairy tale narratives. Special thanks to Huggo for the IMDB summary. 1962 Baltimore. Elisa Esposito (Sally Hawkins), found abandoned as a baby with scars on her neck, has been mute all her life, that disability which has largely led to her not having opportunities. Despite being a bright woman, she works a manual labor job as a cleaner at a military research facility where she has long been friends with fellow cleaner, Zelda Fuller (Octavia Spencer), who often translates her sign language to others at the facility. And she has had no romance in her life, her major emotional support, beyond Zelda, being her aging gay artist neighbor, Giles (Richard Jenkins), the two who live in adjoining apartment units above a movie theater. Like Elisa, Giles is lonely, his homosexuality complicating both his personal and professional life, the latter as a commercial graphic artist. Elisa’s life changes when Colonel Richard Strickland (Michael Shannon) brings a new “asset” into the facility, Elisa discovering it being a seeming mixed human/amphibious creature found in the waters of the Amazon. Secretly visiting with the creature, Elisa is immediately drawn to him, and despite he having a violent side as part of his inherent being, the two find a way to communicate with each other and end up forming a bond with each other. Elisa has to decide what to do when she discovers that although the reason for bringing the creature to the facility is to test the possibility of him being sent into space, Colonel Strickland, who has always had antagonistic feelings toward the creature, ultimately wants to kill him, this following the systematic torture he has inflicted on him. Elisa may have to balance her feelings on wanting to be with the creature against what may be the greater benefit to him of being set free back into the wilds of the water. Complicating matters are that the Soviets are also aware of the creature, they having a secret agent who has infiltrated the facility. Smarter people then I have reviewed this film to death already. So I won’t pretend to impart the same learnings as them in my review of this film, but I will acknowledge that there is some derivation at work here. As Chris will rightly point out in his own thoughts on our upcoming Deep Dive; this is a story that effectively borrows from other films. The Beauty and the Beast story arc is the bones of this film, it also throws in homages to monster movies (Creature from the Black Lagoon), musicals (Shirley Temple, That Night in Rio) and biblical stories (The Story of Ruth). But where the brilliance comes in is in altering the arcs of these stories. The beast doesn’t transform to be loved, the creature from the black lagoon doesn’t die AND gets the girl, the mute girl and her two minority friends save the day, and love of the arts is celebrated. That said, even if you don’t know these things, this film challenges the notion of fearing the other – it fights fear with love, and I think it smartly uses Giles (an artist), as a narrator of this ideal, in a time when those ideas couldn’t even exist in popular culture. Giles is a closeted homosexual, someone who dreams and imagines how things could be, and I have a theory that a lot of the film actually happens in his mind. Pros: It carefully crafts all of it’s themes and ultimately tells a universal story of acceptance, love, and celebrating what is, rather then what should be. del Toro is at his personal best, and he poses some great questions. Cons: While beautiful to behold, and universally clear in the truths it wants to share, to fully appreciate the story, you might actually need to love all of the things it references – the subtle historical shifts at play. And if you want character nuance, the characterizations could be frustrating to watch. Points of Interest: Guillermo del Toro wrote lengthy backstories for each of the major characters, giving them each the option to use the information or ignore it. Some opted to take the direction, while some, like Richard Jenkins, refused it. The poem at the end of film has been paraphrased from works by Persian poet Rumi and his predecessor Hakim Sanai. I really do see why Chris struggles with this film. And believe it or not, I’m not picking apart his thesis before he’s had a chance to defend himself, but rather I want to show you that his perspective is key in understanding my own theory. The derivative themes, the abstracted characterizations, and the reliance on style as a vehicle for the underlying substance are important. If we consider that the whole story is told from the perspective of an artist character (Richard Jenkins) who has had to hide so much of himself in a time and space of persecution and judgment, then I think the story takes on new meaning. Not to mention the fact that his chosen form of expression, painting, is being supplanted by photography in advertising. Giles loves musicals, lives above a theatre that shows biblical films, and draws the creature he does not understand lovingly. He wants to see a fairy tale realized because his own story did not come through as he wished. Additionally, he is the most detailed of the characters, which is often how we see ourselves, as opposed to how we simplify others in our own life stories. 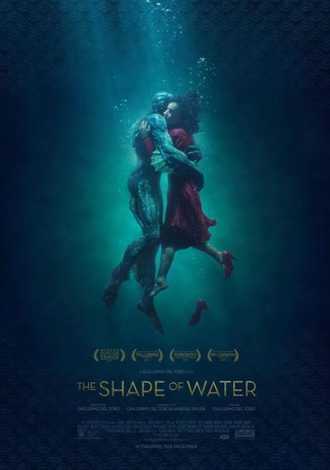 I think The Shape of Water is an amazing film, and to be honest, I haven’t even given you the full expression of my thoughts on it yet, but I believe that the upcoming Cross Talk deep dive episode will reveal even more about it. A fairy tale for adults is an amazing thing to behold, indeed. If you want another fairy tale for adults, then you should check out this video review of 2010’s Scott Pilgrim VS the World, an anti-thesis to rom-coms told from the perspective of a video game geek. It’s a blast to watch, and whether you grew up between the 1980s to 1990s or not, the nostalgia callbacks are insightful. So please let me know what you thought of our review, like and share the video, and subscribe to the channel if you haven’t already. There are even more theories coming up next week, y’all come back now.